Leprosy is one of the oldest infectious diseases. It dates back to the beginning of the civilizations of Egypt, India and China and has been described in biblical texts. Known also as Hansen’s disease, it is caused by Mycobacterium leprae, a slow-growing, resistant, aerobic bacillus. This infectious condition mainly affects the skin, peripheral nerves, mucosa of the upper respiratory tract and eyes. Leprosy can complicate, resulting in peripheral neuropathy, a condition that affects the sense of touch which makes it impossible to perceive pain and temperature. In these cases, patients may suffer burns, cuts or other injuries without realizing it. When the disease evolves to peripheral neuropathy, the most recurrent lesion is the loss of one or more fingers. The muscular weakness that it causes also leads to deformities in the fingers due to the involvement of the ulnar nerve. The highest incidence is in India, Brazil and Indonesia; for 2011, 80 percent of the 219,000 registered cases occurred in those countries. In 2009, 213 new leprosy patients were reported in the United States, of whom 65 percent came from the states of California, Florida, Hawaii, Louisiana, Massachusetts, New York and Texas. And most of them were immigrants from barely developing countries. Leprosy does not tend to be contagious and rarely causes death. It can be treated effectively with antibiotics but, even today, patients are socially stigmatized because previously there was no cure and those who suffered from it had visible disfigurement and significant disabilities that caused fear and rejection from others. Leprosy can appear at any age but is more frequent in people between five and 15 years or those over 30. Leprosy is a curable disease that when treated early can reduce the chances of disability. Mycobacterium leprae is the cause of this infection. It is an acid-fast bacillus that ends up affecting skin, peripheral nerves, respiratory tract, and eyes. 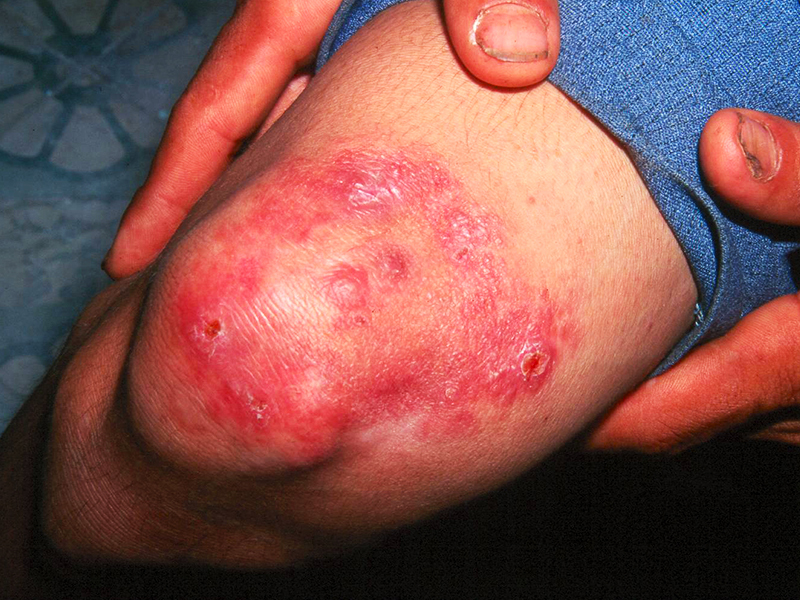 It can be classified in several ways, but the most common are tuberculoid and lepromatous. Both produce ulcers on the skin; however, lepromatous is more severe because it produces large bumps, nodules, and swelling. Since 1995, the World Health Organization (WHO) provides free treatment to all patients with leprosy in the world. In 2000, WHO achieved the elimination of leprosy disease as a global public health problem by reducing its morbidity rate to less than one case per 10 thousand inhabitants worldwide. Paucibacillary: Less than or equal to five skin lesions that do not have bacteria in samples. Multibacillary: Greater than or equal to six skin lesions in which bacteria are present in samples. Indeterminate: Lesions are mild, usually hypopigmented or erythematous macules. Tuberculoid: Only a few cutaneous lesions in asymmetric forms and clear boundary. They are hypopigmented and anesthetic; edges remain active and in constant evolution. Thickening of peripheral nerves, lymphadenopathies, fever, necrotizing vasculitis and erythema nodosum may also occur. Lepromatous: They are polymorphic skin lesions whether they are macules, nodules or diffuse infiltration, distributed symmetrically. This classification affects a large part of the skin surface and has greater neural and visceral involvement. It produces thickening of auricular pavilions, nasal involvement with progressive destruction of cartilage and the nasal bone, loss of the tail of the eyebrows (madarosis), iritis, keratitis, glove and stocking anesthesia with infections prone to deformations of feet and hands (mononeuritis multiple). Dimorphous: This classification has three subgroups of doubtful immunology – dimorph-tuberculoid, dimorph pure and dimorph-lepromatous – in which lesions are inconsistent with undefined edges and they have frequent nervous affectation. Early diagnosis is important because symptoms do not usually appear until well after a year of infection. The average is between five and seven years and once they start to show, they evolve slowly. Leprosy affects mainly the skin and peripheral nerves. This nervous commitment causes, in general, numbness and weakness. Now, according to the classification, it includes other signs. Tuberculoid leprosy: Affected areas have no sensitiveness due to injury of underlying peripheral nerves. Lepromatous leprosy: Much of the skin and organs such as kidneys, nose and testicles can be compromised. Peripheral neuropathy is more severe presenting more numb areas. Some muscles weaken and some patients lose eyebrows and eyelashes. Feet: Plantar ulcers with a secondary infection that causes immobility. Nose: Injury of the nasal mucosa that causes chronic nasal congestion and epistaxis (nosebleed); if left untreated erosion and collapse of the nasal septum can occur. Eyes: Iritis can cause glaucoma; sensitivity in the corneas can lead to scarring and blindness. Kidneys: Renal amyloidosis leads to kidney failure. Sexual function: Men with lepromatous leprosy experience erectile dysfunction and sterility. This infection decreases the secretion of testosterone and sperm in the testicles. Diagnosis is through a microscopic examination of a sample obtained by skin biopsy. In the United States, leprosy diagnosis takes longer. Suspicion comes due to the appearance of cutaneous lesions and peripheral neuropathy, and confirmation is possible only by examination under a microscope. Samples taken for biopsy should be from areas where tuberculoid or lepromatous lesions advance, either from nodules or plaques. Epidemiology: Contact history, time spent in endemic areas. Clinic: Hypopigmented and hypoesthetic lesions on the skin and thickening of peripheral nerves. Sensitivity scan with filaments of different thicknesses. Skin smear: The liquid obtained by pinching skin fold of several macules, nodules or plaques and making a small cut is analyzed to identify acid-fast bacillus (AFB) such as tuberculosis or Phylum Apicomplexa (intestinal coccidia), among others. The treatment is a long-term polypharmacological regimen composed of the drugs dapsone, rifampicin and, in some instances, clofazimine. Sometimes, antibiotics are prescribed for life. It is important to note that medications stop the progression of the disease but do not reverse the damage it has caused, such as nerve injuries and deformities. Therefore, early detection and treatment are essential; the antibiotic resistance of the bacteria may lead to different drug regimens. Drugs prescription depends on the type of leprosy; multibacillary medicine requires more intensive regimens. Paucibacillary: 600 milligrams (mg) of rifampicin once a month, plus 100 mg of dapsone a day for six months. In children, the doses are 10 mg per kilogram (kg) in weight per day of rifampicin plus, 1 mg per kg in weight per day of dapsone for one year. Multibacillary: 600 mg of rifampicin once a month, together with 100 mg of dapsone per day and 50 mg of clofazimine per day for at least two years or until the skin smears are negative for bacilli. In children, the doses are 10 mg per kg of weight per day of rifampicin plus 1 mg per kg of weight per day of dapsone and 1 mg per kg of weight per day of clofazimine for one year. Have you Heard about Colorectal Cancer?